Fossil records provide evidence that some 150,000 to 200,000 years ago a group of early humans first appeared in Ethiopia. According to the prevailing “out of Africa” view, some 50,000 years ago, they reappeared in Europe. Alternatively, other scientists have favored a “multiregional theory,” that modern humans originated independently in different parts of the world. 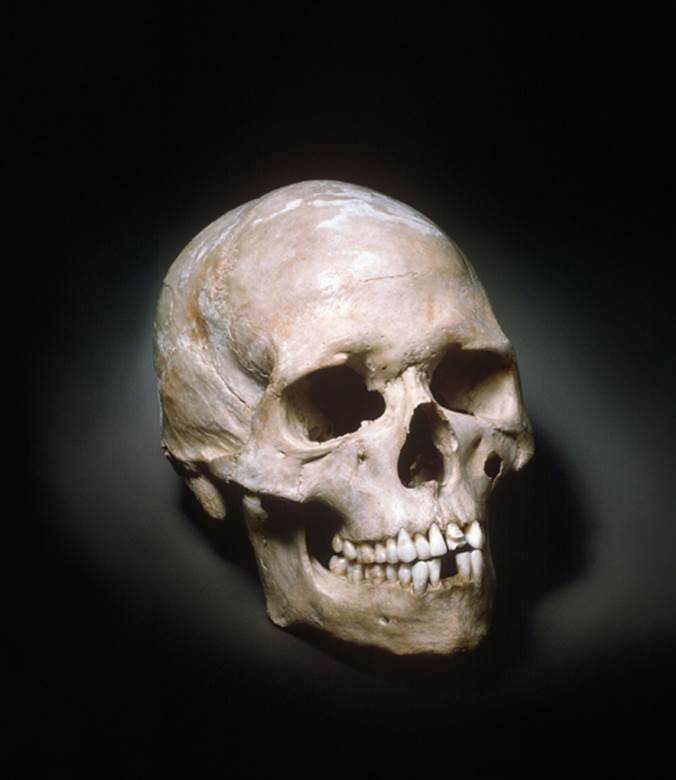 When compared to contemporary humans, they were of approximately the same height, walked upright, but had a more robust build, and had less prominent eye ridges, the protruding layers of bone above the eye socket. In short, they closely resembled us in appearance and, therefore, have been designated Anatomically Modern Humans (AMH) or Early Modern Humans. Experts are currently debating whether the AMH achieved anatomical modernity first (150,000–200,000 years ago) and later adopted modern behavior—such as developing a modern language, the capacity for abstract thought and symbolism, making more sophisticated tools—or whether anatomical and behavioral modernity were achieved simultaneously. The earliest AMH to appear in Western Europe have been commonly referred to as Cro-Magnon. During the past twenty years, experts have argued that since they were not that different from modern humans, they are undeserving of a separate designation and should be called European Early Modern Humans. Their first skeletal remains were discovered in 1868 by the French geologist Édouard Lartet in a cave that now bears his name. Later-discovered remains suggest that they inhabited Europe 45,000 to up to 10,000 years ago. The Cro-Magnons were nomadic hunter-gathers who wove clothing and practiced elaborate rituals. Their remains of carved statuettes of animals and people provide evidence that they produced the earliest human art. Paleolithic cave paintings have been found in Spain and France, and the most famous such cave—which contains some 600 multicolored paintings and drawings of animals and symbols, dated to c. 15,000 BCE—was discovered at Lascaux, France, in 1940. Evidence suggests that the Cro-Magnons coexisted with the earlier Neanderthals for at least 10,000 years prior to the Cro-Magnon becoming extinct. The Neanderthals disappeared over 30,000 years ago. SEE ALSO: Primates (c. 65 Million BCE), Neanderthals (c. 350,000 BCE), Radiometric Dating (1907), Lucy (1974), Mitochondrial Eve (1987), Oldest DNA and Human Evolution (2013). This 13,000-year-old skull of a Cro-Magnon man, said to be Europe’s first anatomically modern human, was found at the Bichon Cave in the western Swiss canton of Neuchâtel.